Enjoy this light and airy topping without having to be concerned with fat. Chilled instant nonfat dry milk, unflavored gelatin and sugar make this topping a treat you'll find easy to serve and enjoy. 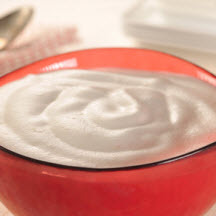 If whipped topping develops an airy appearance, simply stir vigorously to restore smooth appearance. For best results, prepare same day as serving.